Clowns have a sense of humour, make us laugh, are absurd, hilarious – the red nose, floppy shoes and slapstick would be inappropriate at a funeral – but Roelof van Wijngaarden is a Dutch “mourning clown” who offers friendship and intense understanding in his death-defining act. He is not looking for laughs, but to loosen up the audience at the final curtain. Roelof van Wijngaarden is Holland’s “mourning clown” although he prefers the term “ritual clown.” A professional clown for over 10 years, his appearances at funerals constitute only a very small part of his work. “There is a great deal of interest in the role of the clown in funeral expressions, while grief processing can come in many forms. There is also the grief of those incapacitated through an accident, Alzheimer’s, dementia, mental illness, addiction, those marginalized by society.” His interest in providing a supporting role in the lives of people impacted by exceptional situations, has found him performing in nursing homes, handicapped institutions, schools, hospitals, as well as funerals. Van Wijngaarden has always been fascinated with how other non- western cultures have incorporated funereal clowns into their death rituals. The cultural aspects of dealing with their emotions and honouring the life of the departed with wailing, chanting, dancing, song, celebration, storytelling, all to honour the dead, and in finding personal ways for expressing grief, celebrating life and releasing emotions. “We live in a hard society where people like to feel that they have control over their lives. That life can be measured, controlled, insured. It is away for people to create their own world where they feel safe. It is an illusion. Playing upon our fears, we become over insured, take out a policy for every contingency. We look for guaranties. Even to neatly insuring death. We are invited to break tradition and taboos in how we view death. Van Wijngaarden is part of a Network of Funeral Service Renovators, bringing together innovation and the talents of over 100 members, funeral directors, morticians, artists, ceramicists, dramatists, musicians, writers, all offering alternative ways to say farewell. There appears to be a breaking through of the conventional procedures orchestrated by an undertaker. People want to consciously contribute to providing the form, in personal wishes honouring the deceased, in performance arts, or in waddling cloths, specially designed urns, custom made coffins, painted lids, or other creative expressions. Recently at the funeral of a very vain person, he first polished the lid of the coffin before facing the public, and remarked, “So, now you are nicely laid out, looking all neat and proper.” The mourners are bewildered, curious, and obviously reserved. It takes a bit of getting used to the clown, but once he gets started, he is even able to generate a warm round of applause for the deceased. You can feel the audience begin to soften from their cold restraint. However, he’s not always looking for laughs. Through his work with CliniClowns he came into contact with seriously ill children, and also with death. Entertainment and distraction in the hospital only reaches so far. 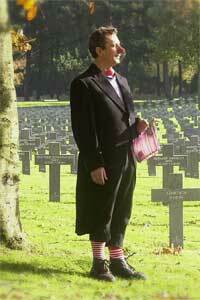 The “mourning clown” brings more depth to human contact. His passion to reach those hardest to reach, to help unburden those bound up in grief and unexpressed emotions, to lighten lives, this is his inspired calling. Gentle clowning is a manner of making contact without words. A hand on a shoulder, a hug, an affectionate touch, warm looks. “The gentle, small presence of the clown draws those to him who are willing to meet him. The closer we are to nature, to our natural response, the stronger the contact. The gentle clown is just who he is, and what you know, or think that you may know is given a place in the midst of your doubt, grief and panic. He is a comforting presence.” Van Wijngaarden concluded. In answer to the many requests to learn to be a “ritual clown” Van Wijngaarden offers special workshops on “gentle clowning” based on the gentle teachings of American John McGee PH.D. Respect, gentleness, sincerity and unconditional love for the person, are key, in touching the “heart to heart” of emotions.